The Big Imagine Sleepout! What's My Why? On Friday 17 November, myself and my family will be taking part in The Big Imagine Sleepout and joining over 150 people in spending the night beneath the stars exposed to the elements to raise awareness, as well as vital funds to help those currently facing homelessness in Watford. 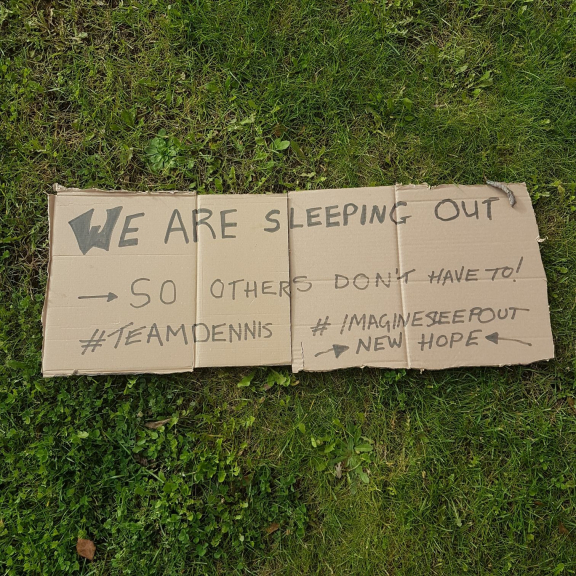 I wanted to share with you why #TeamDennis is taking part and how you can help. Yes, many people become homeless because they can no longer afford the rent BUT for many, life events like a relationship breaking down, losing a job, mental or physical health problems, or substance misuse can be the trigger. As someone who has worked with people who are homeless, when you listen to their story you soon realise that it can happen to ANY one of us. Once you are homeless these problems are even harder to resolve. If this statistic doesn't make you want to support The Big Imagine Sleepout then maybe these will? Right now, there is an unprecedented number of people facing the same situation every night (with no basic needs forfilled: warmth, food, safety, let alone love and opportunities for a better life) because they are 'one of the above'. My family and those taking part in The Big Imagine Sleepout are are lucky (for now) it's just one night we are giving up a cozy bed, to help make a difference to the people through no fault of their own will be facing much harsher conditions than what we'll be experiencing a week Friday in Fullerians Rugby Club (with 150 people by our side). If you would like to support #TeamDennis please buy a raffle ticket for £5 BUY A RAFFLE TICKET.